In the 18 years I have been installing outdoor lighting I’ve come across all the different types of garden lights from the early days of fibre-optic’s to halogen lights, from LEDs to neon. 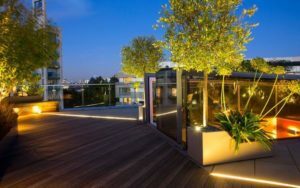 There are many ways to carry out garden lighting but the best way to ensure a successful installation is to use a 12 volts or 24 volts extra low-voltage system. One reason why I become a big believer in extra low-voltage system’s is that once you have a good understanding of how to connect the garden lights and use heat shrink, you too can become competent in low voltage installation and maintenance. Moreover, I’ve never come across a 240 volt RCD protected outdoor lighting system that did not have tripping issues within the first three years of installation and I’ve seen a lot! 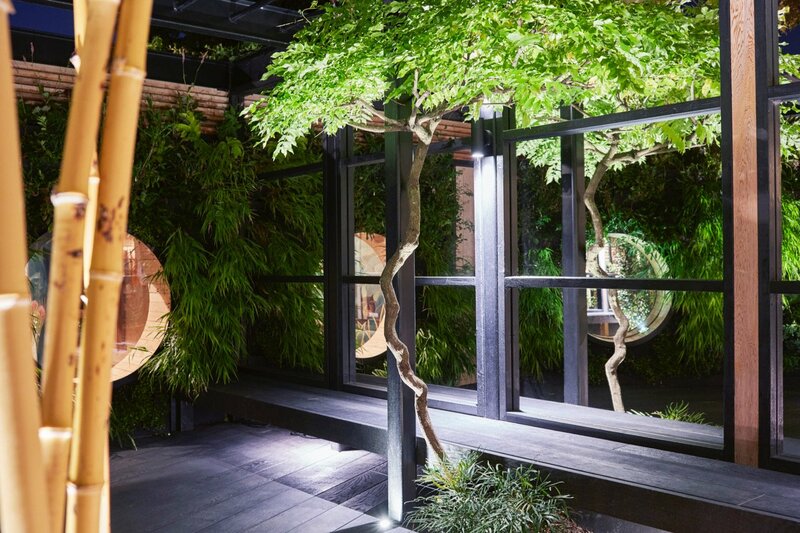 The first and probably the most important task for any landscape company wishing to incorporate garden lighting installation into their service is to find a competent electrician. Someone who is willing to work with you and alongside you for the long term. This is not always as easy as it sounds, however there are lots of good electricians out there that are willing to work on landscaping projects. It is important that a certified electrician is involved on all the lighting scheme decisions and to follow his guidance in all matters. Below I have set out a basic guide as to how to set up the your service, including the do’s and don’ts and aspects of regulatory laws to keep in mind. I would recommend you buy a copy of the latest onsite guide and keep it on hand. This book has clear and simple guidance on common requirements such as depths of buried cables and the various cable sizes. 1) Find a local certified electrician. Contact the NICE or Elecsa for a list of registered electrician in your area. 2) Set out the landscape design / layout and how you will carry out the different areas of work between the electrician and yourself. 3) According to UK regulations, extra low voltage lighting that does not have moulded plug ends, have to be carried out by a competent person. However your electrician can teach and guide your staff to attain the competency in a very short time (1-2days see guide below). 5) Once all cables and outdoor lights are in position. Second fix the installation, which simply means connecting it all together. 6) Test the system and asses the outdoor lights at night to ensure they are lighting the various features correctly. Always play around with the angles as very small adjustments always make a big difference. The main areas that as a landscaper, you cannot touch will be the mains voltage (240v) side of the installation. The following would require a qualified electrician to carry out. Connecting of armoured cables and all 240 volt rated items. Including junction boxes, remote controls, switching systems, led drivers or transformers and mains voltage lighting. Your electrician must also carry out a full list of dead tests and live tests to ensure the installation complies with government electrical regulations. He must also provide a certificate of compliance either physical or online to the customer. This is required by law and is very important. 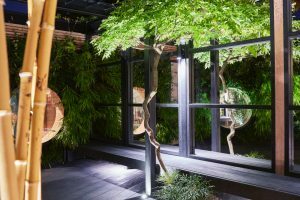 Once you have developed a working relationship with your electrician you can now offer your customers a full service that will ensure their garden looks great all year round both during the day and at night. When running ELV lighting you must protect the cable by running it in some sort of conduit. This will save you may return journeys to repair animal and gardener damage. I have never been a fan of moulded or cross spike quick connectors for the simple fact that they always eventually either do one of the following; overheat, lose connection, corrode or the tightening nut snaps on the connector. Moreover, with a lot of moulded systems, it’s impossible to run it through protective conduit which is essential to protect the cable. Running a LED fitting from the transformer, will depend on the size of cable and power of lamps and the type of driver/transformer used. When we install our cabling and while joining each fitting, we ensure 12v is read at each point a light is connected. If the reading goes low (between 11-10v) just run another cable and either make a ring or another radial. This becomes instinctive within a few installations as you will get a sense of how far you can run the cables. As an example 6x 4watt fittings running away from a LED driver, I would expect to be able to run lights at least 15-20meters depending on spacing. We have always used warm white lamps in our installations unless directed otherwise. The reason for this is that 2700-3000k is the best colour for lighting nature. Landscape’s tend to get flattened by cool or neutral lamps. 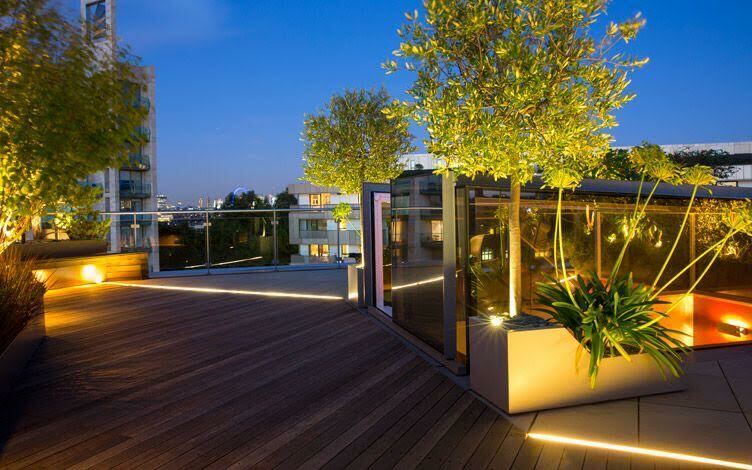 For further information and help with creating fantastic landscape lighting schemes please do not hesitate to contact us at info@hamiltonlighting.co.uk, where our enthusiastic and friendly staff will be able to help.